Earlier this year, Epic Films released a trailer of Wastelander Panda, the story of an anthropomorphic panda named Arcayus, who wanders a post-apocalyptic wasteland. 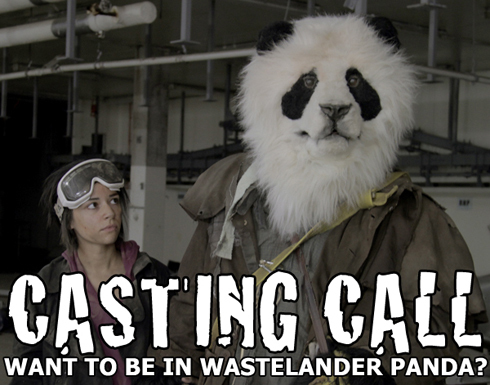 After a successful bid to raise funds to turn the trailer into a three-episode series, Wastelander Panda went into pre-production and, on August 27, a casting call was made. Filming of the series will take place over November 5-23, and will mostly occur in Adelaide, South Australia, with some additional filming in the Flinders Ranges. The parts to be cast include Rose (a human girl), gang members, and a family unit. In addition to these human parts, auditions will also be held for two actors to play "hybrid animal characters" in fursuits. The deadline for applications is September 2. Extras casting will take place later, in October. I submitted this on Tuesday. It took four days to get through the editorial queue? Seriously? Yes. It would have been later if I had published all submissions in the order they were received; there are nine queued. If I had noticed the piece's time-sensitivity earlier, I would have posted it sooner. My apologies. Now that sounds interest! but since I think you guys said it's being done in australia.. I don't think I have much of a chance to be able to do this anyhow but I'm so into the hybrid animal caracter costumes now after reading/ seeing Island of Dr. Moreau, it's not even funny.. Too bad i live all the way in Canada..